Could You Pass Today's "Intro. to Theology" Exam at St. Vincent's Middle School? Are you smarter than a thirteen year old? Today my Middle School religion students took part two of their Soteriology exam. (Part one dealt with key New Testament soteriological passages.) How would you do? 1. Characterize liberal soteriology in a short answer. 2. What is the satisfaction theory of atonement? Who is the most prominent theologian associated with it in the Middle Ages? 3. What does the Christus Victor theory say? 4. What was the "founding father" of liberal theology in early nineteenth-century Germany? According to George Conger and The Church of England Newspaper, a two-thirds majority of the provinces of the world-wide Anglican Communion has rejected the Episcopal Church's House of Bishops' response to the requests made of them by the Primates at Dar-es-Salaam as inadequate. Of the 38 primates, including the Archbishop of York, Dr. John Sentamu, Lambeth Palace reported it had received 26 responses, and no reply from 12. Of the 26, 12 stated they could accept the JSC’s findings, 12 stated they rejected the JSC’s findings, while three offered a mixed verdict, and one said it was continuing to review the matter. Of those who had not responded, three were from Africa, three from the Indian subcontinent, two from Central and South America, and four from other areas. However, based on past statements from the African and South Asian provinces, the majority reporting a mixed or negative response will be increased to roughly a two third’s margin once their views are communicated to London. The church building is a beautiful example of the late Victorian neo-Gothic found throughout Texas. The first Eucharist of the day was celebrated according to the 1928 Book of Common Prayer. It was the first such '28 Prayer Book Eucharist I had ever even attended, let alone celebrated! Then tonight I performed the first baptism of my ministry as a priest. Audrey is a lovely 87-year old lady who is my mother's roommate at her nursing home here in the Mid-Cities. I have been talking with her about the faith for about a month. Late last week she expressed a desire to be baptized. And tonight she was, in her bed at the home, surrounded by her family. It was a marvelous experience. May God bless Audrey in her walk with Christ. There have been a couple of significant public statements in the last day regarding the realignment presently underway in North American Anglicanism. 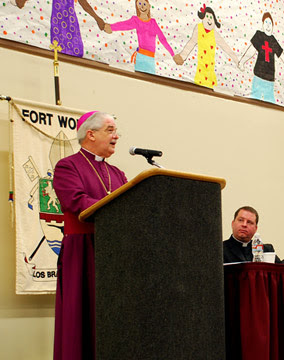 One is a letter of support for Bishop Iker of Fort Worth from dozens of leaders in the Church of England. In says, in part, "We fully applaud the stand you have taken for scriptural and traditional Faith and Order, the departure from which of The Episcopal Church (TEC) has been deeply damaging and divisive within the Anglican Communion, and in our relationships with major ecumenical partners. The leadership of TEC’s use of litigation against faithful congregations and clergy is nothing short of a scandal ... [.] We are delighted by the Archbishop of Canterbury’s statement in response to Bishop John Howe of Central Florida that any diocese compliant with Windsor remained in communion with the See of Canterbury and the mainstream of the Anglican Communion, and trust that you and your diocese will be encouraged thereby. We hope and pray that you, your clergy and people will find an appropriate way to remain true to the faith and order of the universal Church within the fellowship of the Anglican Communion." We recognize that the Province of Canada has failed to provide ... “Adequate Episcopal Oversight”, and in fact, in places like the diocese of New Westminster, has taken actions to close biblically faithful churches and discipline biblically faithful priests for remaining faithful to the teaching and practice of the Anglican Communion. We commend Bishop Donald Harvey for his willingness to come out of retirement to provide Adequate Episcopal Oversight for those biblically faithful, communion-committed Anglicans in Canada who require such oversight and protection. We recognize this will allow their gospel ministry to flourish and grow, while the Communion seeks to find a way forward through this crisis. We have welcomed Bishop Harvey to many of our Global South meetings and we recognize him as a godly and humble servant. In a different direction, The Times of London is reporting that, "The Pope will discuss how to deal with the increasing numbers of disaffected Anglicans wanting to join the Roman Catholic Church at a meeting with cardinals from around the world. Benedict XVI, who is making the reunification of Christendom a goal of his pontificate, is considering requests from at least three US Episcopal bishops for reception into the Catholic Church [RWF: the three would include Bishop Steenson of the Rio Grande and retired Bishop Lipscomb, formerly of SW Florida, but who is the third convert?]. He has also been approached by an entire breakaway group of traditionalist Anglicans" [RWF--this is presumably the TAC, or perhaps a group of Irish Anglicans who are converting]. Tonight the Rt. Rev. Keith Ackerman, bishop of the diocese of Quincy, Illinois, was the preacher and celebrant at our Thanksgiving eve Eucharist. His sermon was an exuberant reflection on the blessings God has given us in creation, and in the gift of his Son Jesus Christ for our salvation. Our family meals tomorrow are reflections of the Great Thanksgiving Meal of the altar. The picture above shows the blessing of the bread for our Thanksgiving feasts by Bishop Ackerman. May God bless all the readers of this blog and their families with a happy Thanksgiving. And for those who will enjoy the game after their meals: "Go Cowboys!" The good folks over at Stand Firm have hit upon a marvelous way to show support for a faithful shepherd of his flock. Get your button today by clicking here! If you have not already done so, please, PLEASE, watch and listen to it now. It is marvelous. As I listened I could not help thinking that I was hearing the voice of Athanasius (albeit a rather polite Athanasius). He speaks plainly and clearly. And he speaks the truth. The video may be found here at Anglican TV. The written text may be found here. Well, I am home from convention. The bishop's address was outstanding and passionate. But other than that, it was a very polite, almost low key affair. No major theatrics from either side. But big votes were taken, including our first votes on a series of constitutional and canon changes that will sever our relationship with the GenCon national Episcopal church if ratified at our 2008 convention. The big ones included Canon 32, which was changed to allow for parishes to negotiate to leave our diocese and take their property with them if they do not wish to depart TEC with us. It passed with 88% of the clergy vote, and 82% of the lay vote. Since this canon required only one vote to become effective, it will soon take effect. The proposal to remove the name of the Episcopal church from the preamble to our constitution and allow parishes outside of our geographical boundaries to join us passed with 83.5% of clergy and 78.8% of laity voting in favor of the change. Finally, the vote to remove our accession to the constitutions and canons of the GenCon national church passed with 83% of the clergy vote and 77.2% of the lay vote. This is the one that will officially "take us out of TEC" if ratified in 2008. The "submit and comply" amendments proposed by Via Media folks failed to pass by similar margins. One amendment would have restored our accession clause to the form TEC's lawyer Mr. Beers has demanded by removing our caveat that acts of GenCon that are contrary to Holy Scripture and apostolic tradition were null and void here. This "submit and comply" amendment failed with only 16.5% of clergy voting for it and 19.6% of the laity. Finally a "submit and comply" amendment to recognize that the national GenCon church owned all of our property (rather than our diocesan corporation) received a mere 12% of the clergy vote and 13% of the lay vote. This article is also interesting. It has some important quotes from Archbishop Venables about the present crisis, and their offer of a safe haven to our diocese and others. Highlights are below (emphasis added). “We simply told them, if you are going to leave, then we will do our best to receive you in a temporary and pastoral way,” [++Venables] said. “Knowing the Southern Cone’s desire for everyone to be able to stay within the Communion until this situation is in some way or another resolved, the dioceses who are already in close relationship with us discussed the possibility. “We are not going to cross boundaries in this. If [dioceses] want to leave, then they’ve made their decision, and the doors are open — but only those who have taken the steps to walk away from the Episcopal Church,” he emphasised. The three Forward in Faith (FiF) dioceses of Fort Worth, Quincy, and San Joaquin confirmed at the FiF international conference in London last month that conversations about affiliating with an overseas province were “very far along” (News, 26 October). George Conger has a fine summary piece on recent developments in the realignment. It may found here. I urge you to take a look at it. And, be it further resolved, that the Bishop and Standing Committee prepare a report for this diocese on the constitutional and canonical implications and means of accepting this invitation. At their provincial synod last week in Valparaiso, Chile, the Anglican Province of the Southern Cone passed a resolution regarding the dioceses that are considering departing from TEC. The text of the resolution follows, with the final two paragraphs being particularly important for the four dioceses who are presently considering departing from TEC to realign with another province overseas. We recognizing with great thankfulness the diocese and parishes clergy and laity of the Episcopal Church in the USA who have continually made clear their desire to remain faithful to the historic faith and order of the Anglican Communion. 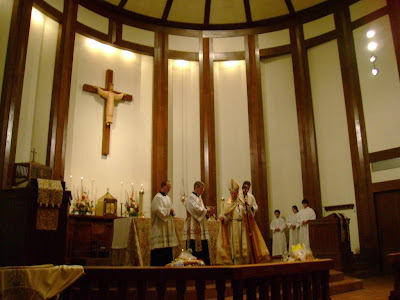 WE the Provincial Synod of SCA meeting in Valpariso in Chile Nov. 2007 welcome into membership of our province on an emergency and pastoral basis those dioceses of the Episcopal Church taking appropriate action to separate from that church. We do this in order that such dioceses may continue in the mainstream of the Anglican Communion and be faithful to its Biblical and historic teaching and witness; and we pray for God's grace and help to resolve the painful, critical situation in our beloved Anglican Communion. Bishop Iker has posted his reply to PB Schori on the diocesan website. It may be found here. While I do not wish to meet antagonism with antagonism, I must remind you that 25 years ago this month, the newly formed Diocese of Fort Worth voluntarily voted to enter into union with the General Convention of the Episcopal Church. If circumstances warrant it, we can likewise, by voluntary vote, terminate that relationship. Your aggressive, dictatorial posturing has no place in that decision. Sadly, however, your missive will now be one of the factors that our Convention will consider as we determine the future course of this diocese for the next 25 years and beyond, under God’s grace and guidance. In closing, let me be very clear. While your threats deeply sadden us, they do not frighten us. We will continue to stand firm for the unchanging truth of the Holy Scriptures and the redeeming Gospel of our Lord and Savior Jesus Christ, whatever the costs. I shall continue to pray for you, as I trust you will pray for me, in the difficult days ahead. Tonight our choir at St. Vincent's sang Evensong beautifully to the greater glory of God. There were about 300 people in attendance! Then following worship we all trooped to the parish hall for "Building Up the Body of Christ," a gathering of folks from the Common Cause Partnership in the north Texas area. There were even visitors from the dioceses of Western Louisiana and Newark. Bishop Ray Sutton of the Reformed Episcopal Church was our featured speaker, and Bishop Iker also addressed the gathering. There was then an extended opportunity to ask the bishops questions following their remarks. This event was astonishingly uplifting for me, and I gather many others felt the same. With our big vote at diocesan convention now less than a week away, I found it very encouraging to glimpse the future of orthodox Anglicanism in North America made tangible over a potluck supper. We received further encouragement from representatives of Christ Church, Plano, which left TEC and is now a part of AMiA, and St. Matthias, Dallas, which now is part of the province of the Southern Cone. These brothers assured us that although it wasn't easy to leave their friends in the diocese of Dallas behind their parishes have now been freed to proclaim the Gospel. They are glad not to be hemmed in by the difficulties afflicting TEC. I can imagine it would be liberating. May the clergy and people of Fort Worth know that freedom to preach the Gospel unhindered soon! Well, on the same day the Province of the Southern Cone in South America offered our diocese and others safe haven, Bishop Iker received PB Schori's threatening letter in the mail. Here is the text for PB Schori's letter (hat tip to Stand Firm). As you are undoubtedly aware, it is my view that recent amendments to your Diocese's constitution violate the Constitutional requirement that the Diocese maintain an "unqualified accession" to the Constitution and Canons of the Episcopal Church. I have now reviewed several proposed constitutional amendments that will be considered at your forthcoming diocesan convention. It is evident to me that several of these proposed changes would further violate the Church's Constitution, while some other proposed changes would undo the problems created by the earlier amendments. It is clear from your public statements and from what I understand your position to be regarding these matters that you endorse the first set of changes. Your statements and actions in recent months demonstrate an intention to lead your diocese into a position that would purportedly permit it to depart from the Episcopal Church. All these efforts, in my view, display a fundamental misunderstanding of the relationship between The Episcopal Church and its dioceses. I call upon you to recede from this direction and to lead your diocese on a new course that recognizes the interdependent and hierarchical relationship between the national Church and its dioceses and parishes. That relationship is at the heart of our mission, as expressed in our polity. Specifically, I sincerely hope that you will change your position and urge your diocese at its forthcoming convention to adopt the proposed amendments that will bring the Diocese's constitution into agreement with the Church's Constitution and Canons. If your course does not change, I shall regrettably be compelled to see that appropriate canonical steps are promptly taken to consider whether you have abandoned the Communion of this Church -- by actions and substantive statements, however, they may be phrased -- and whether you have committed canonical offences that warrant disciplinary action. The British-born Archbishop, who is the Primate of the Province of the Southern Cone, told the Telegraph: "This is a pivotal moment in the history of the Anglican Communion. "The new realignment demonstrates the depths of the divisions that already exist. " Dr Williams appears to want to keep the Communion together at all costs, but Gospel truth should never be sacrificed for structural unity. "Conservatives in America and elsewhere cannot wait in limbo any longer. They need a safe haven now." Archbishop Venables unveiled the decision of his bishops and other leaders after the plans were overwhelmingly approved by his provincial synod during a meeting in Chile last night. A handful of conservative American dioceses are already in the process of opting out of the Episcopal Church by voting in their diocesan synods to alter their constitutions. Up to five are expected to become part of the Southern Cone, which covers most of South America except Brazil, over the next six months or so." As you know, the diocese of Fort Worth will be voting next week on the first reading of changes to our diocesan constitution and canons that would allow us to affiliate with another province of the world-wide Anglican Communion. Please pray for wisdom for the leaders and people of our diocese and for the good clergy and people of the Province of the Southern Cone at this crucial time. A story on the same topic from The Living Church may be found here. The organ at the cathedral is receiving its final two ranks of pipes this week. They are not yet quite fully operational, but should be in a week's time. Also, one of our parishioners has made a beautiful canopy for the bishop's cathedra. Doesn't it look marvelous? TitusOneNine featured a couple of articles this evening that fit together so well that they begged for comment. 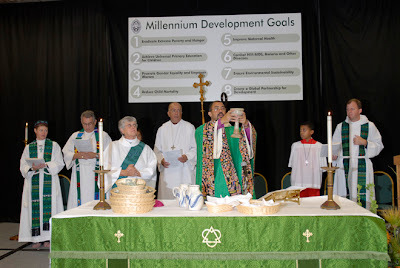 The first was about the recently concluded diocesan convention of the diocese of Michigan. It features the picture below. A huge sign tauting the Millenium Development Goals of the UN looms over the altar, dwarfing the cross in front of it. It is a stark reminder that, even in those places where TEC is not dominated by heresy, one is frequently more likely to find left-wing political activism than a straight-forward proclamation of the Gospel of Jesus Christ. And as laudable as many of the MDG's may be, they are no substitute for the Good News. ASA loss per day: 42 attendees. The 2005 average ASA is 74 attendees, so this means losing an average congregation of worshippers every 2 days for 6 years. From the diocese of Pittsburgh's website (hat tip to Stand Firm). That is almost 67% in favor. That is almost 82% in favor! Tonight after our Mass at St. Vincent's (where I preached, but have no text to post unfortunately) my father and a group of friends from the parish went with me to a Mexican restaurant. 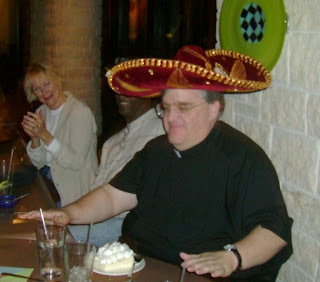 There I celebrated my 43rd birthday (I'm an All Saints' baby) by wearing a birthday sombrero and eating tres leches cake. A good time was had by all. A nice change of pace after PB Shori's broadside of last night!